Fairfield’s Kylie Fauber corals the ball near the net as she is chased by a Fayetteville defender on Wednesday at Fairfield High School. Fairfield honored senior players from the boys and girls teams in between games on Wednesday. The Fairfield boys and girls soccer team hosted Fayetteville on Wednesday at Fairfield High School and honored the senior soccer players from both teams between games. There were five senior boys; Wyatt Fent, Zach Ison, Tanner Collins, Nick Evans and Andrew Dingey as well as two senior girls; Trinity Huff and Lyndee Spargur. “The other seniors Wyatt Fent, Andrew Dingey and Nick Evans have been very welcome additions to us. They are starters at this point in the season. They are all guys that you want on your team. Dingey has been a rock on the back line all year for us. Wyatt has speed, we are getting there with him. He is learning as he goes along. Nick got off to a rough start with a hurt ankle but he is coming back strong now. We are coming around with those seniors. Great attitudes, great guys,” Alexander said. The boys team were first on the field Wednesday as they took on the Rockets in Southern Hills Athletic Conference play. Fayetteville struck early in the first half to take a 1-0 lead with more than 20 minutes to play. The Lions were able to get the game tying goal with just over two minutes to play in the first half when Jordan Cameron converted on a penalty kick. Following halftime with the score tied at one the Rockets were able to strike again with 29 minutes to play in the game to take a 2-1 lead that they would not relinquish. In the girls matchup the Lady Lions struck early and often as they cruised to a 5-1 win. Lyndee Spargur got things started for Fairfield in the 34th minute when she netted a goal off an assist from Cadence Saunders. The second goal for the Lady Lions in the 28th minute and two minutes later Ella Newkirk added a third goal. Newkirk added the fourth goal in the 21st minute off an assist by Saunders. Lyndee Spargur finished off the scoring for Fairfield off an assist from Newkirk to give Fairfield a 5-0 lead. The Lady Rockets scored one goal in the first half to provide a 5-1 halftime score in favor of the Lady Lions. 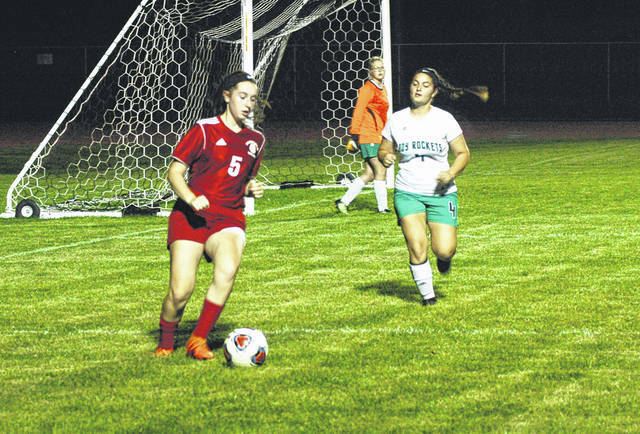 The second half was a defensive battle between the teams and neither one was able to convert offensively as the game ended with the score still 5-1.
https://www.timesgazette.com/wp-content/uploads/sites/33/2018/10/web1_Fairfield-Soccer.jpgFairfield’s Kylie Fauber corals the ball near the net as she is chased by a Fayetteville defender on Wednesday at Fairfield High School. Fairfield honored senior players from the boys and girls teams in between games on Wednesday.